My son recently came back from a science day camp with one of the coolest things. It was a model of the Earth that he had created out of modeling clay. It showed the internal structure of the Earth, and because he built it, he was able to remember all of the layers of the Earth. Very cool. So here’s a good way to learn the Earth layers for kids. To make your own, you need some modeling clay of different colors. You start by making a ball about 1.2 cm across. This represents the Earth’s inner core. Then you make a second ball about 3 cm across. This ball represents the Earth’s outer core. Then you make a third ball about 6 cm across. This ball represents the Earth’s mantle. And finally, you make some flattened pieces of clay that will be the Earth’s crust. To make it extra realistic, make some pieces blue and others green. Take inner core and surround it with the outer core, and then surround that by the mantle. Cover the entire mantle with a thin layer of blue, and then put on some green continents on top of the blue. If you’ve been really careful, you should be able to take a sharp knife and slice your Earth ball in half. You should be able to see the Earth’s layers inside, just like you’d see the real Earth’s layers. And you can see that the mantle is thicker underneath the Earth’s continents than it is under the oceans. Here’s a link with more information from Purdue University so you can do the experiment yourself. If you’re interested in teaching your children Earth science, here’s lots of information about volcanoes for kids. We have also recorded a whole episode of Astronomy Cast just about Earth. Listen here, Episode 51: Earth. Here’s a question: how big is Earth? Let’s take a look at how big our planet is. First, the equatorial diameter of Earth is 12,756 km. In other words, if you dug a tunnel on the equator that went straight down and went right through the center of the Earth, it would be about 12,756 km long. Just for comparison, that’s about 1.9 times the diameter of Mars. And only .09% the diameter of Jupiter. The volume of Earth is 1.08 x 1012 km3. Written another way, that’s 1.08 trillion cubic kilometers of rock and metal. Again, it’s about 6.6 times more volume than Mars. The surface area of Earth is 510,072,000 square kilometers. Of that, 29.2% is covered by land and 70.8% is covered by water. Just for comparison, that’s 3.5 times as much surface area as Mars. The mass of Earth is 5.97 x 1024 kg. Here that is written out: 5,970,000,000,000,000,000,000,000 kg. Yeah, that’s a really big number. And yet, it’s only 0.3% the mass of Jupiter (and Jupiter is mostly lightweight hydrogen). We have written many articles about Earth for Universe Today. Here’s an article about how fast Earth rotates, and here’s an article about Earth’s magnetic field. 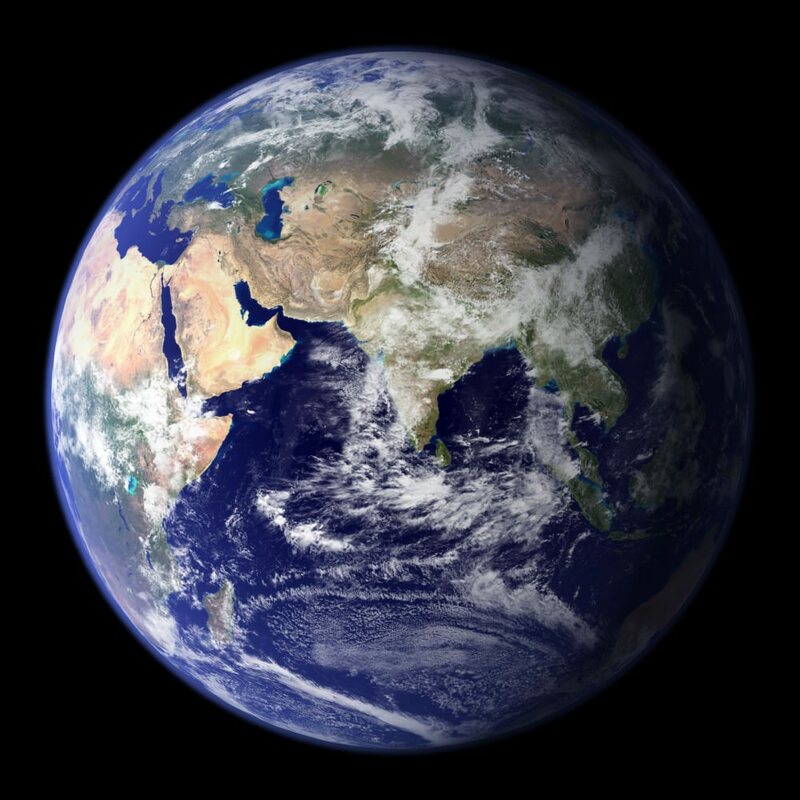 You can learn more about Earth from NASA’s Earth Observatory, as well as NASA’s Solar System Exploration Guide. We have also recorded an entire episode of Astronomy Cast that’s just about Earth. Listen here, Episode 51: Earth. The Earth’s circumference – the distance around the equator – is 40,075 kilometers around. That’s sounded nice and simple, but the question is actually more complicated than that. The circumference changes depending on where you measure it. The Earth’s meridional circumference is 40,008 km, and its average circumference is 40,041 km. Why are there different numbers for the Earth’s circumference? It happens because the Earth is spinning. Think about what happens when you spin around holding a ball on a string. Your rotation creates a force that holds the ball out on the end of the string. And if the string broke, the ball would fly away. Even though the Earth is a solid ball of rock and metal, its rotation causes it to flatten out slightly, bulging at the equator. That bulge isn’t very much, but when you subtract the meridional circumference (the equator when you pass through both poles), and the equatorial circumference, you see that it’s a difference of 67 km. In other words, if you drove your car around the equator of the Earth, you would drive an extra 67 km than you would if you drove from pole to pole to pole. And that’s why the average circumference of Earth is 40,041 km. Which answer is correct? It depends on how accurate you want to be with your calculation. We have written many articles about the Earth for Universe Today. Here’s an article about how fast the Earth rotates, and here’s an article about how round the Earth is.